Today officially marks the beginning of the end of this escapade through Vancouver and Whistler’s Olympics, but in true Wick style, I need to end it with a bang (insert innuendo here). By that I mean a day jam packed with Olympic events. I caught three different disciplines, but none are legitimate events, really. The ladies super-combined is just a combination of two different ski runs, while the skeleton is nothing more than a balls-to-the-wall human missile contest. The new prize for the worst $200 I’ve spent goes to the ticket I bought for the Ladies Super-Combined. I was stuck in a pit, miles from the racers, behind two ski paths, a row of press cubicles with Volkswagen sized cameras, and four fence barricades for the gal catching the occasional edge and bailing into a few spectators. Let’s just say it wasn’t the best spectator sport I’ve caught at the games. I did, however, get to see some of the most technically sound and fastest skiers on earth. 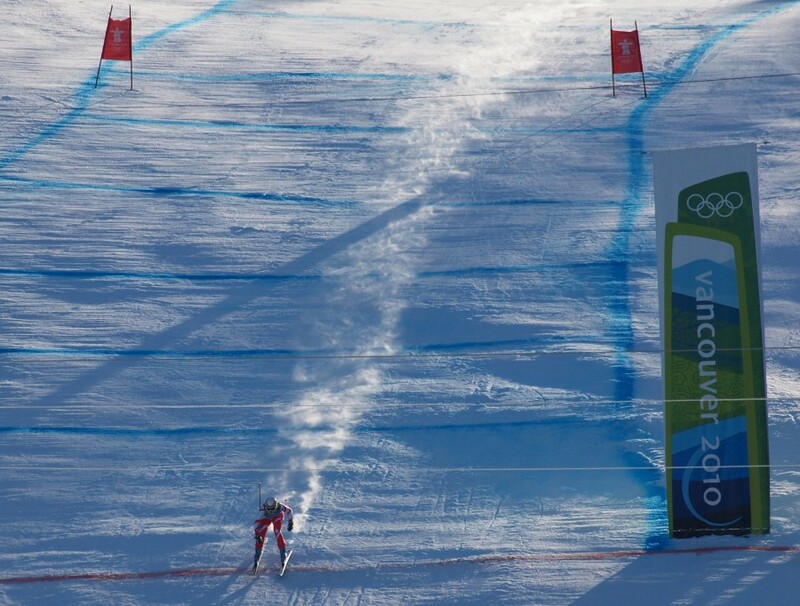 The downhill event is the fastest speed event for Alpine skiing, and where the gates are the farthest apart. To help you imagine this, it’s what you imitate on that run after you’ve put back a few of those lunchtime beers in the lodge. The Super-combined event pairs that up with the most technically challenging event, the slalom, where the gates are really close together. First one down the mountain wins — my kind of skiing. Both are completely different styles of skiing, to the point of being very different sports. The morning was very cold and the snow on top of the hard course a bit sugary. When the competitors flew down the hill (and if you watched the finish of the skiing events, that’s literally true for a large portion of it — they call it the “hot air” jump), they kicked up snow behind them that looked like a trail of smoke. I was quite far away, though, and I like to believe it was smoke. Actually, I would have believed anything to justify the overly priced, awful tickets I bought. The slalom took place, after rebuilding a completely different course in the afternoon, and the conditions totally changed. The icy course for the Downhill was now turning into heavy, wet snow once the sun crept over the Whistler peak, blinding all my cohorts in the (sort of) viewing pit. This was the final run of the day for the skiers, and it is when the energy of the competition ratcheted up. The racers with the best first run times were scheduled to go last, as to increase the suspense I suppose, and that’s just what happened. In my best play-by-play voice . 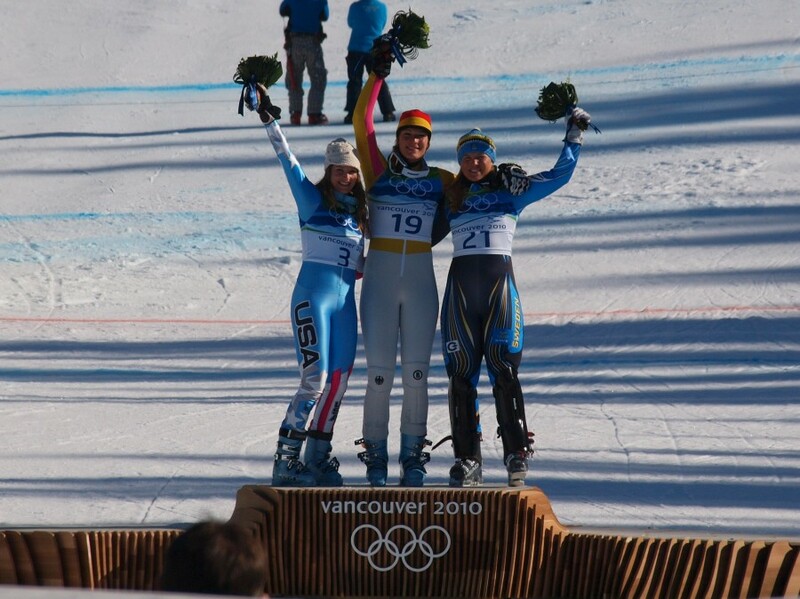 . . Julia Mancuso from the U.S. is sitting in first, followed by Anja Paerson of Sweden. Germany’s Maria Riesh, a favorite, is on course and, Whoa, we have a new leader! Next, America’s Lindsey Vonn, already a gold medalist at the games. She’s killing the course, is looks like a gold medal run to me, folks. Three quarters down the run and things are looking good . . . Wait, No! She goes down! The Vonn-couver Games is no more! The stands were electric as she went down the hill, the obvious favorite, but you could hear a pin drop when she slid down the slope on her back. The few Germans, in their lederhosen, were the only ones to be heard as their gal took home the gold. The wicked finish almost, not quite but almost, made me happy I bought those tickets. I’m not sure what drugs the people were on when they thought of Skeleton, but no doubt there were many. I thought the luge was madness, but it doesn’t even compare to what went down that track. 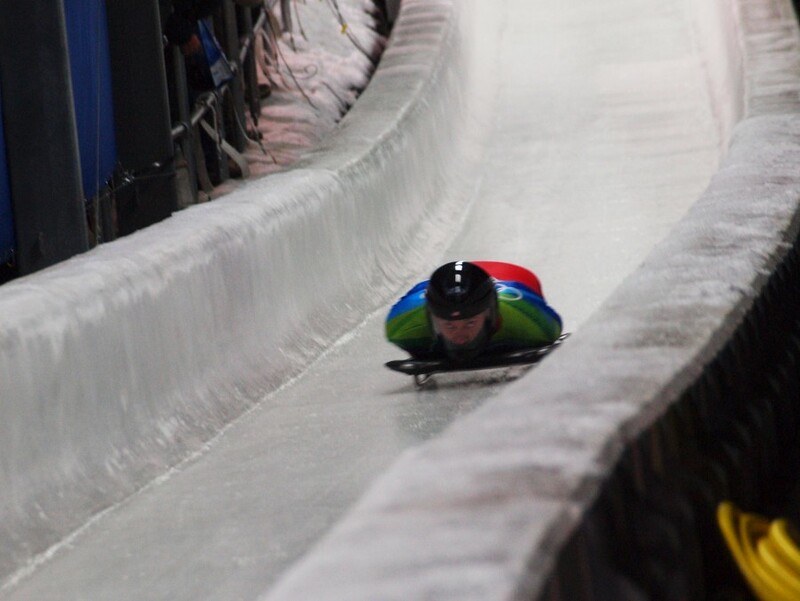 Skeleton has far less handling; the runners are rounded verses a sharper beveled runner on luge sleds, and the speeds are greater. Let’s get this straight for all the academics out there — you can’t really steer the thing, you are going way faster, and by the way, you are now headfirst. On their runs these guys were smashing into walls, hitting the tops of the banked turns, and getting sent into the foam stoppers at the end of the track (the last measure preventing the racers from shooting off the end of the track and hurtling through space). I realize I have an extremely untrained eye, but the degree at which the Skeleton seems completely uncontrolled is mind blowing. The number of times I stood in sheer amazement watching these missiles blast through the Tunderbird Turn, the final picturesque turn over the beautifully manicured Vancouver Olympic Logo, was amazing. And to think, I thought I might enjoy having a go at the Skeleton. After seeing it in person, hell no. 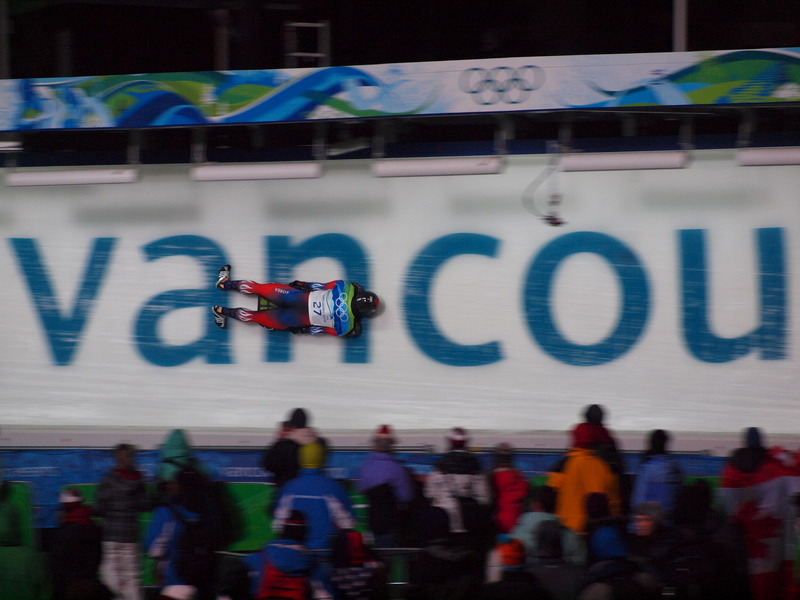 So my trip to the 2010 Olympic Winter Games in Vancouver is now coming to a close. Today is a day of packing, seeing if I can snag some kind of skating ticket on my way out of town tomorrow, and getting ready to head back to the real world. Because let’s face it, events like the Skeleton just shouldn’t happen in the real world.